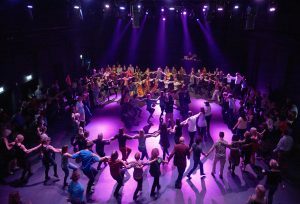 This year, the big dance festival at the Mousonturm is once again the grand conclusion of the Tanztag. Under the headline of trying new things or making new discoveries, on this evening the point is also to celebrate the seemingly endless diversity of dance together in a relaxed atmosphere. After a short introduction, a maximum of dance forms and styles will be tried out or used as a point of departure for your own movement ideas. Dance and celebrate with us into the night, at the Dance Festival 2018! Tanzfest is an event within the frame of the Tanzplattform Rhein-Main. 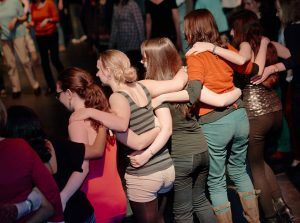 The Tanzplattform Rhein-Main, a projekt of Künstlerhaus Mousonturm and Hessisches Staatsballett, is made possible by Kulturfonds Frankfurt RheinMain and supported by the Kulturamt der Stadt Frankfurt am Main, the Hessisches Ministerium für Wissenschaft und Kunst and the Stiftungsallianz [Aventis Foundation, BHF BANK Stiftung, Crespo Foundation, Dr. Marschner-Stiftung, Stiftung Polytechnische Gesellschaft Frankfurt am Main].